Since the dawn of the information age, people have been concerned about the problem of Information Overload: when people have access and exposure to so much information that they can no longer make good decisions. This happens either when the information sources people are exposed to offer conflicting ideas, making it difficult to chart the best course of action, or when the exact information people need is lost in an endless sea of other information that they don’t need. Creating an information management system will help people manage the problem of information overload. 1) The exact information you need is lost in an endless sea of other information that you don’t need. 2) The information sources you are exposed to offer conflicting ideas, making it difficult to chart the best course of action. The surest strategy for combating information overload is having a system in place to get organized. Developing your own information management strategy will help you stay focused, organized, and efficient. This system can be as basic as setting up three files or folders and naming them IMMEDIATE, SHORT TERM, and LONG TERM, or it can include categories and subcategories that help you keep everything separate. I suspect that if you start out with a simple system, it will gradually grow more complex as you learn what helps you produce optimal results. The most basic organization strategy has three files: Immediate, Short Term, and Long Term. Everything that does not go into one of those files goes into the recycling bin. In a bit you will learn how to arrange and organize your files to make it easy to retrieve your information when you need it, but first, you’ll need to know what to throw away and what to keep. Some information gets top priority because you have to use it right away. This may include nightly or weekly class assignments, new projects at work, bills you have to pay, or any other thing related to your life that must be done as soon as possible. There is no need to set up an elaborate filing system for these items. Simply do what you need to do to get these things done as soon as you can. A great tip a colleague gave me a few years ago is to always do the thing you’re dreading most first. He postulated that the longer you put it off, the harder it becomes to actually make yourself do it. Moreover, doing it quickly frees up your emotional energy for other tasks. Not only will you feel better for getting it over with, you will be less preoccupied by it as you do the other tasks you have set for yourself that day. Before investing a great deal of time and energy regarding new information, make an honest assessment about its relevance to your life. If you are pressed for time, consider if what you are reading, watching, or listening to will help you achieve your goals. It might be interesting, fun, or even educational, but if it is not what your assignment calls for, best to put it away for later. Keep in mind that if something is not relevant now, it might be relevant later, so you don’t have to throw it in the recycle bin just yet. Even if something is about a relevant subject, you shouldn’t necessarily keep it. Make a determination of credibility before you incorporate new information into your understanding of the subject. Very briefly, you need to determine the source’s authority, objectivity, timeliness, and relationship to other sources in the field. Not all information is usable to you at this point. For instance, the raw data in a research study will likely not be useful to you until they have been analyzed and synthesized by the experts in that field. Medical researchers discussing chemical reactions and cellular biology will not be useful to someone seeking more general information about the causes of a disease, just as a doctor searching for a cure is unlikely to find anything of use in the newspaper. 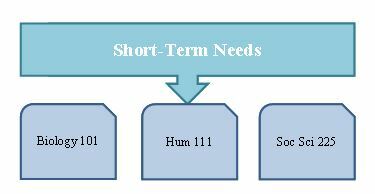 Information that is not used immediately or thrown away should be categorized as a short-term or long-term need. 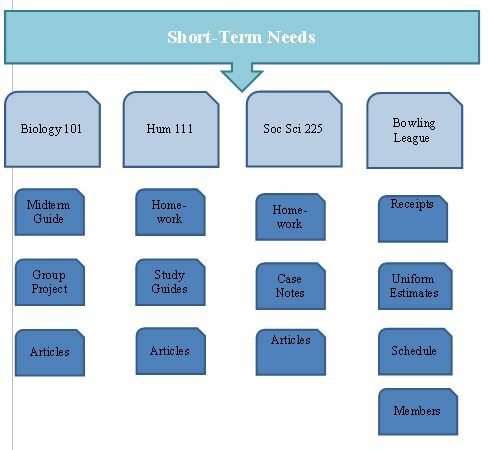 Information to be used for a project due in a couple of weeks, next month, or later in the semester should be considered short-term. Information that you think may be useful to you in the distant future should be filed under long-term. Examples of this are articles or chapters you find that influence your thinking about your major or future career; articles you plan to read after your studies have prepared you for the material; and/or interesting readings that you expect to return to later. After using something for an immediate need you can decide which folder it belongs in. Do you need it again this semester? Does it contain information you can foresee wanting to revisit again in the future? Or if you are unlikely to ever need that particular information again, you can feel free to recycle it. This is a pretty simple configuration that will still help you stay on track. Once you have completed a task and are done with the associated materials, you may choose to recycle the papers, delete the files, or move them to long-term storage in case they will prove useful again one day. If your life is generating LOTS of paperwork, you may consider fleshing your system out a bit more. You can add as many subcategories as you need. A good habit to get into is to skim through your files each night and check on upcoming dates and projects. This will ensure that you are not surprised by deadlines and that you remain focused on your tasks. The advantages of a manual filing system are that such a system requires no technology, can be kept close at hand, and is inexpensive. The main disadvantages are that the information is not as easy to retrieve and is considerably less portable. A temporary filing cabinet, manila file folders, and sticky notes can be bought at any office supply store.. A creative student may find any number of efficacious solutions for information storage, so long as they allow for separate categories of information and a way to tell easily where one category ends and another begins. Some drawbacks to using a manual filing systems is that they take up more space, are less durable, and are inherently harder to sift through. If you are already using computers and accessing the worldwide web, there are a many advantages to storing things online, including portability (anywhere there is a computer and the internet! ), durability (as long as you save backup copies on a timely basis! ), and reduced clutter. You will no doubt be able to find ample documentation online about using Google Drive, OneDrive, Evernote, or any of the other cloud-based or device-based storage systems, each of which has its own set of advantages and disadvantages. I recommend that you try them out and see which works best for you. 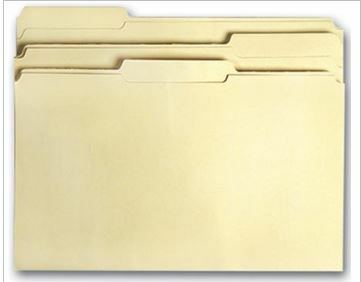 Keep in mind that it will help you stay organized if the system you choose will allow you to create separate folders. If the system will allow you to assign keywords or meta tags, all the better. For instance, in Google Drive Meta tags and keywords. can be added in description field. Click on the document you want to add a description to, find the description field at the bottom right hand side of the screen, and add a description to help you retrieve the document later. For best results avoid overly generic tags such as “school work,” which could potentially apply to hundreds of your documents, as well as overly specific tags which you may forget later. Also, depending on your needs, if you have a home computer system, an inexpensive scanner will allow you to digitize hard copies of documents for storage on your computer, a removable drive, or in cloud storage online. Whichever solution you choose, MAKE SURE you take safeguards to protect your data from hackers. The annotated bibliography is a list of your sources including citations and accompanying descriptions. Sources are listed in alphabetical order by author’s last named, allowing you to keep all of your sources in one place and offering other researchers insight into your materials. The timeliness of the study/paper. In Prevented Mortality and Greenhouse Gas Emissions from Historical and Projected Nuclear Power, Kharecha and Hansen (2013) hypothesized that replacing carbon-producing fuels with nuclear power could “prevent an average of 420 000–7.04 million deaths and 80–240 GtCO2-eq emissions due to fossil fuels by midcentury, depending on which fuel it replaces” (p. 4889). They correlated the historical output of CO2 to the resultant air pollution-related deaths to determine that the use of nuclear power since 1971 has prevented “ an average of 1.84 million air pollution-related deaths and 64 gigatonnes of CO2-equivalent (GtCO2-eq) greenhouse gas (GHG) emissions that would have resulted from fossil fuel burning” (p. 4889). The authors found that increased reliance on nuclear energy would be safer and less ecologically harmful than continued reliance on fossil fuels or expansion of natural gas use. The publisher of this paper, American Chemical Society, is known to be a reputable, peer-reviewed source, but it has lately come under fire by the libertarian-leaning Watts Up With That blog for presenting a political agenda. Because of the known bias of Watts Up With That, such claims are not necessarily prohibitive; likewise, there are no peer-reviewed studies refuting the data of the article. This article is especially useful for discussing the opportunity costs of society’s dependence on coal and oil as well as for calming some of societies’ concerns about nuclear energy. You can download a printable copy of this guide here. After narrowing your subject, creating a search strategy, and searching the databases, book catalog,and open internet, you will hopefully find information in and of sufficient quantity and quality to answer your research question(s). Here are the steps to take after you retrieve your sources. Have you found enough information to answer all the questions you have about your subject? After reading an article begin asking questions: First, who wrote it, and are the author’s affiliations known? Does the language appear biased, or does the article present only one side of an argument? Is the purpose of the article to inform you or to convince you? What does the article leave out? When was the article written? Are there new developments that the article does not take into consideration? How does what you have found complement or contradict what you already thought? Does it come from an authoritative source? Is the source objective, timely, and credible? In general, these considerations will determine how (and if!) you present the materials you have found. For instance, if new research provides a new way of looking at an old problem, it is good to know the timeline. If the new research comes from a think tank funded by a political organization, it should be looked at carefully to determine possible biases. Old research, on the other hand, should not be held up as the state of the art, though it may be useful in describing the social or historical context of your paper. Realize the article is off-topic and of no use to you. Use it to establish the social, political, or scientific context of your topic. Use the article to bolster your claim. Present the article as a counter-argument and then refute it. Realize that you cannot refute the article and modify your thesis. 1.) You must lead into the information. 2.) You must use parenthetical notation after the quote to show where you found it. According to Marylin Gilroy, author of Student Drinking: New Strategies but No Magic Bullet, “Experts say the root causes of excessive drinking revolve around depression, anxiety, peer pressure, and the desire for social acceptance. This is coupled with a culture of drinking often encouraged by local bars, which run promotions where low prices and happy hours offer incentives to drink” (Par. 5). 3.) After each quote, paraphrase, or summary you must explain the quote’s significance regarding what you want to prove or explain in your paper. All of your cited materials should relate to the thing you want to prove, and you must show how they prove your point. 4.) You must have a Works Cited page at the end of your paper. Using the articles you have found to answer your original research questions will provide a basic outline for your paper. The causes of binge drinking among students are academic stress, peer pressure, and a lack of coping skills. Your thesis statement is the road map for your paper. You now know both the substance and the order of your paper. Take quotes, paraphrases and summaries from your sources in order support your thesis. All that remains is for you to write your introduction, present your thesis, arrange your reasons and evidence in a compelling order, and then write your conclusion. Make sure you speak with your instructor about what is expected of you. Also feel free to visit the library and review a copy of whichever style manual you are supposed to use for your paper/project. There are also a number of websites to help you with your citations, such as Purdue OWL (http://owl.english.purdue.edu/). One example of how businesses use information is seen in the “environmental scan,” which is a concept that has existed since the 1960s. The idea is that organizations should keep an eye on the “environment” in order to make informed decisions about future challenges. The environment consists of all the external forces, be they political, social, legal, environmental, or what have you, that could impact the day to day functions of the organization. More generally, this is part of what businesses call “rational decision making,” which is the practice of systematically evaluating multiple possible courses of action and settling on the best one based on relevant facts and evidence. Figure 1: Graphic taken from Zhang, Majid, & Foo (2012). 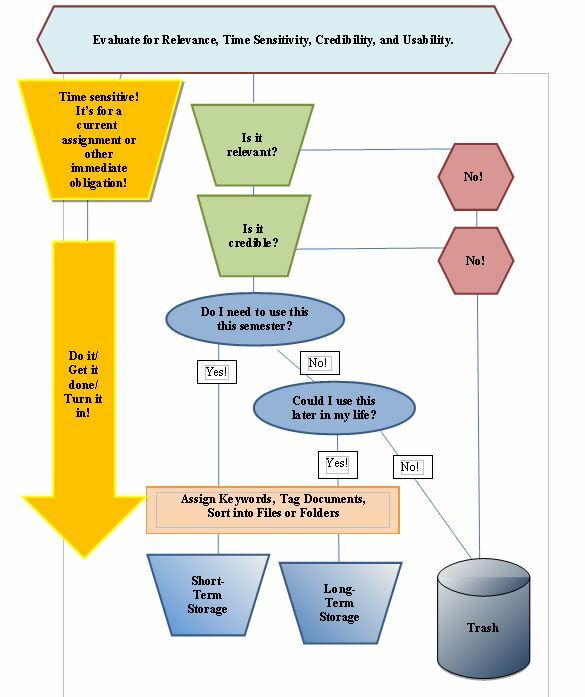 In everyday terms, an organization realizes it needs information, retrieves that information from the best available source (usually based on a metric of cost and currency), synthesizes it into a format usable by the organization, shares it with the appropriate team members, evaluates it, uses it, and stores the process and the results in its internal documents for reference and retrieval. Information may come from a variety of sources, including full-service research suppliers, who will gather and package the information for you. However, if the cost of these services is too great, the organization will harvest the information itself. Such a search in the databases would retrieve any number of useful articles about the impact of old and new regulations on mining practices. It would also be advisable to perform a similar search on government websites by using the usa.gov search portal. After collecting the information, it needs to be organized, evaluated, and synthesized. This often means noting the key points of various sources and tying them together in a way that is meaningful or beneficial to your organization’s practices. Keep in mind that no boss wants a stack of articles; she wants a short synthesis of what is in those articles and what it may mean to the organization. Think relevance, connectivity, and brevity. After synthesizing the information, it needs to be distributed to key players and stakeholders. Making sure that everyone has access to the same information is a key to productive teamwork. Deeper analysis and research happens at this step, so if shortcuts were taken in evaluating or synthesizing the information then it will most likely be exposed at this point. It pays to be exhaustive in your research and critical in your analysis before involving others. Finally, after all stakeholders have had a chance to review and revise the information, discussion of the information’s ultimate meaning take place. This discussion may lead to calls for even more research, even deeper analysis, or to new ideas and strategies. Best practices stipulate that the organization document these discussions and store the information for easy retrieval and review. This is necessary so that the basis for decisions is neither lost nor forgotten, which is crucial for long-term projects.